Tacos and tequila - call it a match made in Margaritaville® heaven. In many ways this pairing makes the perfect meal: Tacos are light yet satisfying and full of fresh ingredients bursting with flavors that are enhanced by the smooth taste of tequila. Infinitely customizable, there are so many taco and tequila pairings that you'll never run out of combos to try! Cilantro and lime are two flavors that should always stick together - they make any dish or drink extra refreshing! A heavy sauce can overwhelm delicate and fresh fish flavor, so in this taco recipe, tilapia filets get a flavor boost from a refreshing marinade of cilantro and lime juice. A Sparkling Lime Frozen Concoction, mixed from tequila, seltzer, lime and cilantro, complements the tacos in every way for an all-around delicious and refreshing meal you'd find served up in an island paradise. Place the fish in a large pan and then add the Greek yogurt, cilantro, lime juice, garlic and salt. Toss together to coat the fish in the mixture. Marinate for at least 20 minutes in the refrigerator, then bake at 350 degrees for 5-7 minutes or until fish is flaky and cooked through. To assemble tacos, warm tortillas in a pan on the stovetop then add fish, a spoonful of minced onion and a handful of cabbage to a tortilla and serve. With ice in the hopper, add tequila, cilantro, lime juice, seltzer and simple syrup to the Margaritaville® Jimmy Buffett Anniversary Edition Key West™ Frozen Concoction Maker® jar. Select the Shave and Blend setting to mix the frozen concoction to the perfect consistency. 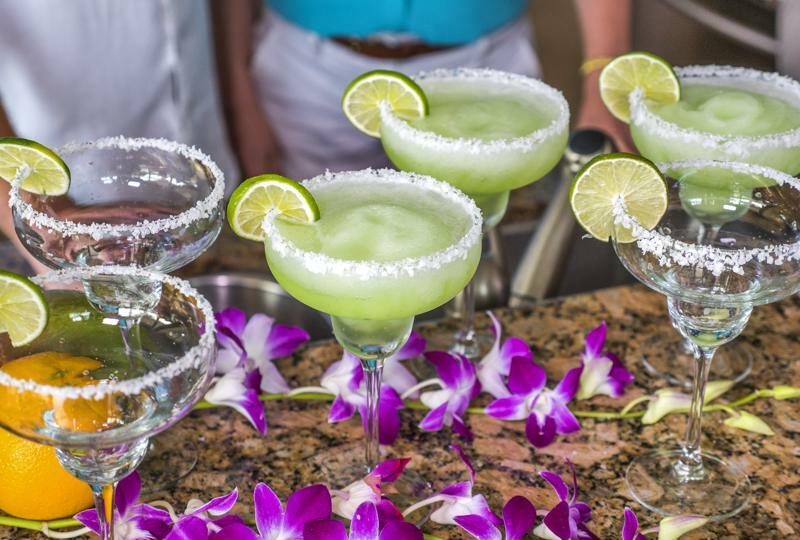 Pour into glasses with salted or sugared rims and garnish with a lime wedge. A sparkling lime frozen concoction is the perfect complement to Cilantro-Lime Fish Tacos. Barbacoa, or shredded beef, is a delicious taco filing. The meat is marinated in a full-bodied barbecue sauce, and then topped with crispy lettuce and crema, a type of cheese which adds a light and fresh topping to the bold barbecue filling. The Sweet Tequila Sipper, made in your Margaritaville® Jimmy Buffett Anniversary Edition Key West™ Frozen Concoction Maker®, complements the sweet barbecue flavors of the tacos with brown sugar and just a hint of spice for a refreshing frozen concoction that's the perfect match to the tacos. Heat the oil on a large pan on the stovetop. Add the strips of beef and cook covered over medium-high heat for 15-20 minutes or until fully cooked. Add the sugar, vinegar, ketchup, garlic, Worcestershire sauce, salt, black pepper, cumin and onion powder and stir to combine and cover the meat. Lower the heat and bring to a simmer; continue to simmer for 5-7 minutes. Meanwhile, heat the tortillas. To assemble the tacos, top a tortilla with the beef, crema and shredded lettuce. For extra bold flavor, drizzle with the marinade before serving. In a medium pan on the stovetop, heat the brown sugar and cumin until it is melted. Add the sugar syrup along with the tequila, orange liqueur, orange juice and lime juice to the Margaritaville® Jimmy Buffett Anniversary Edition Key West™ Frozen Concoction Maker® jar and have ice ready to go in the hopper. Select the Shave and Blend setting to mix the drink the perfect consistency. Pour into glasses rimmed with brown sugar and serve. Top chicken tacos with island flavors. 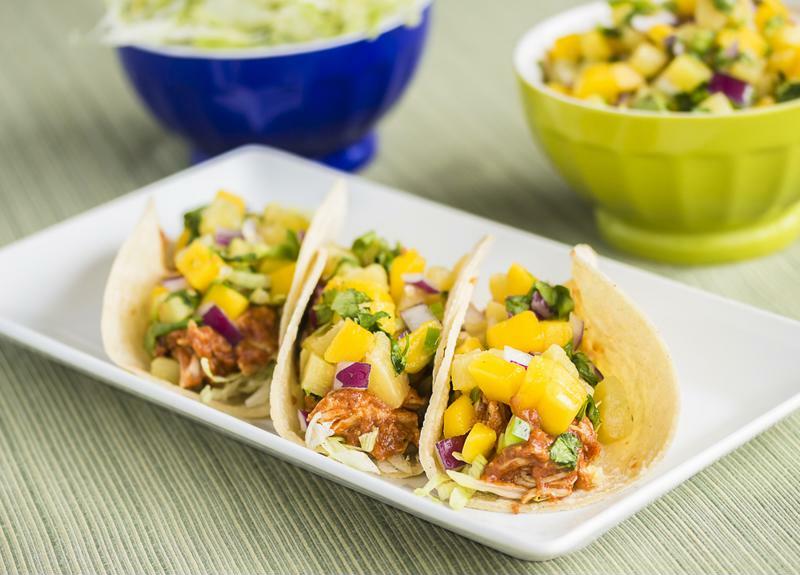 Juicy grilled chicken is marinated in orange juice then topped with crushed pineapple and mango for a meal of paradise-worthy tacos that will transport you to an island escape with each bite. Complete the escape by pairing the tacos with a frozen-margarita twist on the classic tequila sunrise that's bursting with fresh fruit flavor. Grill chicken breasts until fully cooked, then cut into small pieces, place in a bowl and cover with orange juice. Marinate for at least 20 minutes. Meanwhile, mix together pineapple, mango, cilantro, onion, tomato, lime juice and salt in a large bowl. Top a warm tortilla with chicken, followed by several spoonfuls of the pineapple-mango mixture. Sprinkle with shredded Monterey Jack cheese then serve. Add ice to the hopper and the tequila, orange juice, grenadine, orange liqueur and lime juice to the Margaritaville® Jimmy Buffett Anniversary Edition Key West™ Frozen Concoction Maker® jar. Select the Shave and Blend setting to mix the frozen concoction to the perfect consistency. Pour into margarita glasses with salted rims and serve.